On Sunday we witnessed the 88th edition of the esteemed Dutch TT. It was the first time it had been run in the month of July since 1955 and the third time it had been showcased on a Sunday. There was a strong ambience building as we shifted our way towards the circuit, weaving and navigating our small car slowly around copious amounts of scattered traffic cones. The unusually warm weather conditions acted as a magnet, drawing thousands of fans in through the iconic ‘TT’ entrance. During the customary pre-event schedule ex-racer Simon Crafar broke down the intricacy involved in completing a lap around the Dutch circuit. His opinion ran strong stating that he believes this track involves “more rider skill than horsepower”. It lends itself to high speeds due to fast flowing corners and long straights but also historically has a reputation for it’s illustrious altercations between riders. In the past we have seen quarrels between Randy Mamola and Raymond Roche in 1984, Wayne Rainey and Kevin Schwantz in 1991, Nicky Hayden and Colin Edwards in 2006 and Valentino Rossi and Marc Marquez in 2015. Each of these were examples of how vast these riders’ abilities are in a moment of adversity. Their minds are running at a parallel pace to their bikes, brainstorming and preparing themselves for their next move. Speed in perspective, is only one part of their multifaceted job and it’s important to remember the standard of competence these riders obtain in order to claim a number one spot. 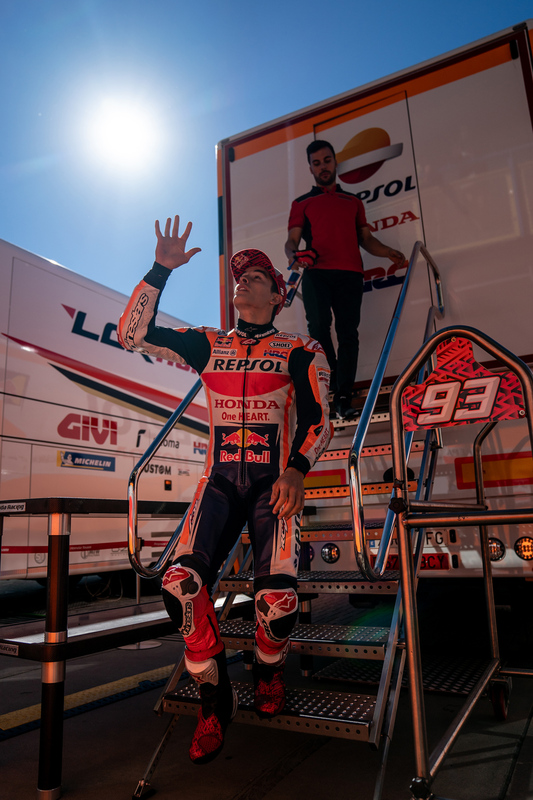 Marquez is an advocate on this topic: “riders make the difference, the rider is [sometimes] more important than the machine”. For just a brief moment let me catch my breath (maybe you need to also because that race was mental!). Now, rewind slightly to the warm up lap where it all began. The grandstands and grass hills were gradually consumed by spectators. Bodies pushed against one another under the bright sunlight in preparation for the spectacle to begin. The lights go out, engines roar and riders set off. The entire grid kept each other at arms length, moving through the corners like a slithering snake. No time passed before the battles ensued and yet the crowd was silent. I don’t mean cheering quietly or being on their best behaviour, I mean silent. No movement, no sound, nothing. Only brief eruptions here and there when a manoeuvre stuck. It is difficult to understand just how quick these corners are until you visit trackside. These athletes are clocking 200km/h through certain curves, squeezing their legs, engaging every single muscle in their bodies, throwing themselves from side to side in order to get around this layout and they still manage to incorporate a fight against each other. These heated exchanges were the grand act of the day and well within the danger zone. 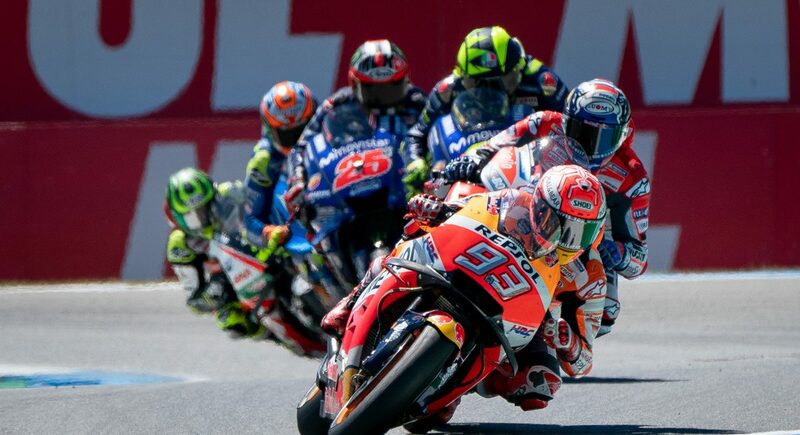 Jorge Lorenzo, Valentino Rossi, Marc Marquez, Maverick Vinales, Alex Rins and Andrea Dovizioso conjured up over one hundred ballsy overtakes in front of our eyes and accompanied them with some thrilling saves. These riders pounced at one another and some even left their own imprint (Jorge Lorenzo suffered a crack at the back of his bike as a result of a brief encounter with Rossi). They were fierce and consistent over the 26 laps and yet were still unable to aptly explain what made it so action packed. Power and or speed wasn’t necessarily a key factor at Assen (as previously referenced by Simon Crafar) and that was reaffirmed by Marquez in the end explaining: “I don’t know how to describe it. It was a crazy race. The conditions shaped the race. The wind kept the group together. In some corners I was half gas but at the same speed. The wind was doing the rest”. This time there was more to the show than just the sheer grunt of the machinery. In the final moments, the spectacle didn’t come down to the wire. It was a clear strategy constructed along the way by the leading World Champion. After seeing +0.2 on his board he realised he could ride ‘his own lines’, without having to defend, giving him the opportunity to set fastest laps towards the end and ultimately put air between him and the chasing group. 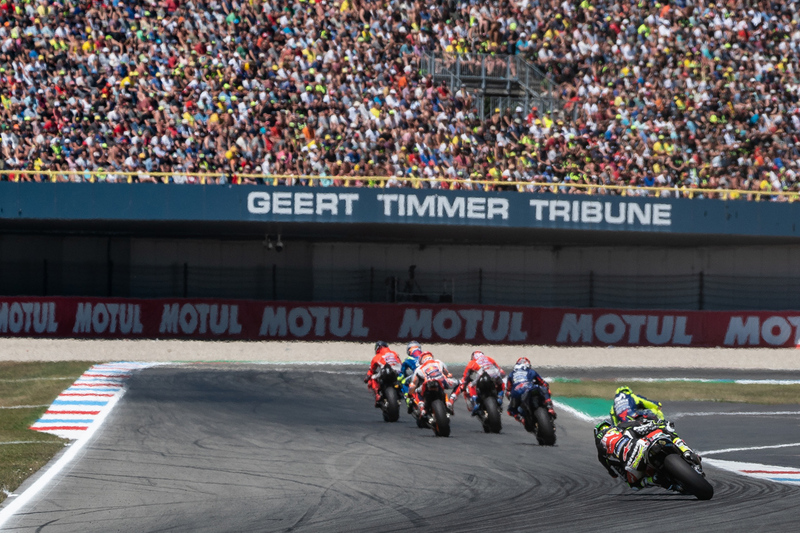 In turn, Assen re-wrote history once again marking the closest the top 15 riders to have ever finished a race, with only 16 seconds separating them. When you take the bikes out of the equation in a race like this, it is the perfect example of proficiency due to the variety of riders (younger, older, newer, more experienced). They are the finest in the business and that is evident in moments like this. Marquez was triumphant in this game of chance, making well thought out decisions with a strong poker face. The reason we were all on the edge of our seat and why we are still talking about this race several hours (and I am sure days and months) after is because the victor was never certain, and like Marquez said: “It was hard to attack and defend. As soon as you attack, someone overtakes you”. So, when the bike is at its peak level, the rest comes down to the athlete and we could clearly see the skill and fire burning within the top eight. Not one of them would admit defeat during the race, even if it resulted in coming face to face with each other. Assen, once again, has provided us with a historical, hard fought spectacle.